Location: Sited below and to the north of the plateau which carries the village but forming a striking object from every direction as the most prominent building in north-west Cardiff. The site first held a pre-Norman monastic church but Urban, the second Norman bishop, decided to rebuild on a greater scale in 1120. The sanctuary arch, two doorways and some fragments survive from the first build, complete in c1170, but this church was mostly replaced by Bishop Henry of Abergavenny in the C13 and the choir, nave and W front survive from this period, though much rebuilt (see below). The nave is of two periods and two designs, with the four W bays rather later in the C13 than the rest. The Lady Chapel is also late C13, while the nave aisles were remodelled in the C14. The W front was given two towers in the later Middle Ages of which the NW or Jasper Tower survives; this dates from the late C15. In the century and a half following the Reformation the building became very decayed and finally, following damage to the roof and NW tower in the Great Storm of 1703, the SW tower collapsed through the nave roof in 1722 (but see References). In 1734 John Wood the elder of Bath was commissioned to fashion a new church out of the choir and the east end of the nave and took the opportunity to put into practice his theories about the form of the Temple of Solomon in Jerusalem. The resulting ''pagan temple'' cost some £7000, and although left unfinished in 1752 (''the whole has the look of a mean market-house or town hall'', Winkle, 1842), was in use for a century amid the ruins of the medieval Cathedral; an idea as bizarre today as it was to the Victorian restorers. In 1841 the Diocesan Architect T H Wyatt began the restoration of the fabric but only fragments of his work remain and the Cathedral today is due almost entirely to John Prichard, the son of the senior Vicar Choral (there were only two), who began with the Lady Chapel east window in 1843. In 1845 he was in sole charge and in 1852 he was commissioned to complete the nave and W front to bring the Cathedral back to a wholly medieval appearance. Unpicking the medieval fabric from the completely demolished ''temple'' showed that Wood had behaved more sensitively than had been imagined and much more ancient fabric was found to have survived than had been expected. Nothing now remains of Wood's building other than the urn in the Processional Way (qv Prebendal House). Prichard took J P Seddon as partner to do this work and it was he who designed many of the fittings and furnishings. The work of restoration and rebuilding was finished in c1870 but in January 1941 a land-mine, exploding immediately outside the south front, brought the Cathedral once again to ruination with the roofs and many of the fittings destroyed. Restoration was begun by Sir Charles Nicholson, who had been Cathedral Architect for many years, but he died in 1949 and the work, including almost all the new fittings, was completed by George Pace between then and 1960. He instigated some important changes like the lowering of the choir arch, changing the shape of the Chapter House roof, and placing a division between nave and choir. The spire, the top of which was dismantled in 1941, was restored in 1956. Since c1960 the Cathedral has remained unaltered. The surviving medieval work is mostly in Dundry stone from Somerset, with some local blue lias and Sutton stone, Purbeck marble being also used internally. The post-Reformation work is in lias, and Chipping Camden and Bath limestones with a little red Radyr sandstone in the Chapter House. The post WWII work is in concrete, faced with glacial pebbles and Pennant sandstone. The roofs are of Welsh slates and lead, almost all replaced post-WWII bomb damage. The plan is nave, with north and south aisles and paired west towers, choir within the nave, sanctuary with ambulatory, Lady Chapel, partly within the main body of the church, Chapter House on the south, St. David's Chapel on the north and this is joined via the Processional Way to the Prebendal House (qv). The West front, with its gabled end to the nave, is Early English, flanked on the left by the almost entirely Perpendicular north-west or Jasper Tower and to the right by the almost entirely Victorian south-west tower. The ground stage has a large central doorway, although this is well above the nave floor level (see Interior). Arched head with continuous chamfer outline, colonnettes and dripmould. Double lobed head to door with carved bishop in the key. Triple arched stage above, higher in the centre and with tight blind arches between. Above in the gable is a stepped arcade with central window and a trefoil headed niche above. Cross to gable. To the right is the south-west tower stair-turret with slits and a continuous mould. All this in the 'West Country' style as also seen in Wales at Llantony Priory (qv Crucorney Community, Monmouthshire). Three stage north-west tower with full height stepped buttresses, strings and octagonal stair-turret. The buttresses were said to have been 'added in modern times' in 1842 and thus may have been added by Wood in c1735 to strengthen the tower following the major collapse in 1722; there is a print made prior to the damage which shows the tower without buttresses, while post damage ones show them in place. The ground stage has a 3-light Victorian window, above, on each face, are a 2-light and then a 3-light window, which repeat from the ground stage, but these are late C15. The then existing battlemented parapet ('a mean and modern battlement', 1842) was replaced by an elaborate filigree crown of the Somerset type (e.g. St. Stephen, Bristol; but it is also modelled on St. John's, Cardiff) by John Prichard. The battlements had replaced a similar crown following the storm damage in 1703. The south-west tower also has three stages but is Early English in character with gabled niches on the buttresses. Two-light windows to each stage, on all faces on the top stage. Corbel table to pierced finialled parapet, tall stone spire with corner pinnacles and with lucarnes on the main faces at the base. The S side of the nave is eight bays separated by stepped buttresses. The aisle windows are 3-light with reticulated heads. The second bay from the left has the Norman south door with four recessed orders and much dog-toothing and zig-zags. Timber lattice outer doors with plank door behind. The clerestorey has large paired lancets with strip pilasters between and a corbel table above; all this invented by Prichard and Seddon from the limited evidence available. The S door is possibly reset, but it is not known when or from where. It remains directly opposite the north door in the proper Norman relationship, but it would be surprising if the Norman Cathedral was as large as that suggests. Both doors were, however, recorded in their present positions in 1842, before the Victorian restoration. ''On the south side all is in ruins to the fifth compartment of the nave and its aisle--from thence to the chapter house the aisle is entire... Though the south porch is gone, the door-way which it covered is still perfect, and is a most beautiful example of the richest Norman work.'' (Winkle 1842) All the features on this side were damaged by bomb blast in 1941 and repaired soon after WWII. Very steeply pitched roof above, much more so than previous to 1703. This treatment is repeated on the north side of the nave except that the second and third bays are largely covered by St. David's Chapel, see below; while the Norman N door is now entirely an internal feature (see Interior). The Sanctuary is two bays and is clearly of an earlier date and character although evidence of the Norman Church survives only internally. The aisle windows are a continuation of the north aisle ones, with 2-light windows in the clerestorey above. The exception is in the south aisle wall, next to the Chapter House, where there is a 5-light window with segmental head and reticulated tracery, and also an arched doorway into the aisle beside it, this last is Victorian. Roundel in the east gable wall above the roof of the Lady Chapel. Gable verges and apex cross, the roofline is carried through from the nave and the roof structure is wholly Prichard and post WWII when the chancel arch was lowered and the external division of the roof removed. The first bay of the Sanctuary on the S side is covered by the Chapter House. This is square going to octagonal but the upper floor and the characteristic pointed roof were entirely reconstructed in c1850 and again after bomb damage in c1950. It is built of rubble stone with corner buttresses, lancet windows, some paired on the upper storey and a bell-cast roof. This last is a post WWII feature as the entire roof structure was removed by the bomb. The east end has a 3-light window in each aisle and then the projecting three bay Lady Chapel. This has a large 5-light window with Geometric tracery in the east end, the first thing restored by Prichard and dating from c1844. The side walls have three 2-light windows with trefoil heads. C15 type low pitch roof with battlemented parapets and corner pinnacles, although this was actually a Prichard alteration made necessary by his heightening of the Sanctuary. The final external feature is St. David's Chapel dating from 1953-6 and designed by George Pace. This covers the second and third bays of the N side of the nave (see above) and projects to an unlit apsed end for the altar. The E wall has continuous glazing at high level, descending to low level as well at the altar end. The W wall has full height glazing. All is divided into narrow lights with concrete mullions and occasional transoms. Smoothly faced parapets above rubble walling, hidden roof. The chapel is reached through the Norman N door of the Cathedral and is part of the Processional Way which continues to the Prebendal House (qv). The W door leads immediately to a flight of six steps down to the floor of the nave; previous to restoration the floor seems to have been four steps below the door (see Winkle). The roofed space is continuous for ten bays although it is divided into nave and choir by the concrete parabolic arches carrying a cylinder containing organ pipes and fronted by Sir Jacob Epstein's ''Christ in Majesty'' of 1957. There are four bays of larger piers and then smaller ones which are evidently slightly earlier but all are of Early English type. The division between them marks the position of the W front of John Wood's ''temple'', see History. Most of the work at this level is medieval but the clerestorey is almost wholly Prichard while the compartmented timber ceiling is by George Pace, completed in 1955; the divisions are 24 x 5 with an extra half on either side. Most of the Prichard and Seddon fittings, which were very fine, were destroyed by the bomb, some fragments of the choir stalls were re-incorporated but the rest are almost all by Pace, including the pulpit of 1957. The Pre-Raphaelite glass and other decorations were not in the Cathedral at the time of the bomb and escaped. The E window over the sanctuary arch has glass designed by John Piper and made by Patrick Reyntiens in 1959. The font dates from 1952 and was designed by Allan Durst. The S aisle was largely reconstructed post-WWII and has a Pace designed plaster ceiling. The choir has Pace designed stalls reusing parts of the Prichard and Seddon ones, but their Bishop's Throne survives. Many good monuments, both medieval, like that to Bishop Marshall (died 1496) and those to important late C19 bishops, Alfred Ollivant (died1882) by H H Armstead, and Richard Lewis (died 1909) by Goscombe John. There is also the memorial in the Lady Chapel to George Pace, Cathedral Architect 1949-75. There is much glass in the choir aisles by Burne-Jones and Morris and Co. as all was removed for safety in the war. The earliest is the 1866 E window in the S aisle which was given by John Prichard and his sisters in memory of their parents who are buried immediately outside, as is Prichard himself (qv churchyard memorials). This was the first window in the Cathedral to be ordered from Morris and Co. The S choir aisle contains the Celtic cross discovered by Bishop Ollivant in the Palace dairy well in 1870. The Lady Chapel has a Perpendicular reredos restored in 1933; and painted stencil patterns over the walls and vaults done by Geoffrey Webb in 1909. The Chapter House has four quadripartite vaults carried on a central shaft with a water-holding base. The upper room was entirely reconstructed by Pace. The village school was held there during the C18 and early C19. The Norman N door of the Cathedral has three recessed orders of zig-zag moulding on the outer face, now within the Processional Way which goes through pointed side arches by St. David's Chapel to the Prebendal House (qv). The chapel, completed in 1956, was entirely fitted and furnished by Pace and is the Welch Regiment Memorial Chapel. 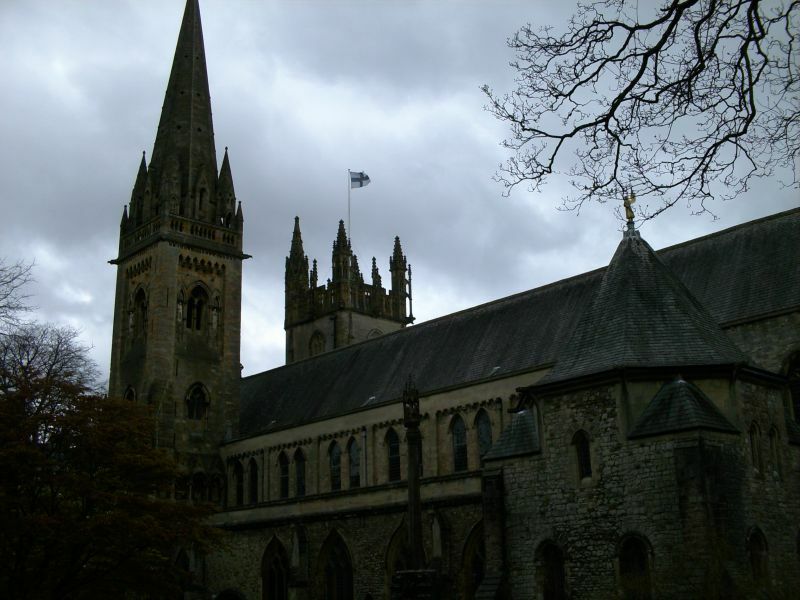 Included and highly graded as one of the four medieval Cathedrals of Wales and also for its particularly dramatic building history and the fine quality of its features. In the Cathedral Churchyard outside the south choir aisle. In the Cathedral Churchyard outside the south wall of the Lady Chapel. Running along the street frontage of the Cathedral Churchyard.